As an Arts Affiliate of Business to Arts, you are entitled to discounts on creative and charity job advertising and recruitment services via our partnership with Creative Careers – Ireland’s jobs and recruitment service for the arts, culture and creative industries, and its sister company Charity Careers Ireland – specialist recruiters for the charity sector. 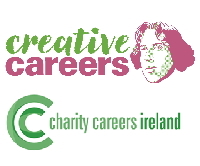 All creative charities that advertise their job on CreativeCareers.ie can also avail of a free job advert with the sister company, Charity Careers Ireland. For further information and discount codes, please contact us.